It brightens up my face and does a great job of highlighting. 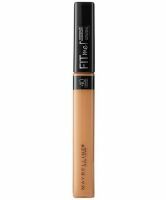 This concealer only gives a light to medium coverage so it might not be for those who are looking for a miracle worker. I like the consistency of this. Not too watery or too heavy. Just right. And also my perfect shade. I got this in Sand and the problem I have with concealers is that it has too much pink, white, or yellow undertones. M...read morey skin has a yellow slightly pink undertone and this didn't leave my skin too yellow or pale. It had just the right amount of yellow in it to make my skin glow and look natural. Love this...I find myself reaching for this often. If you are used to a thicker concealer, this is going to be a surprise for you. The consistency to this is rather watery to say something like MUFE waterproof concealer or Lorac. There are only six shades available which is rather unfortunate.